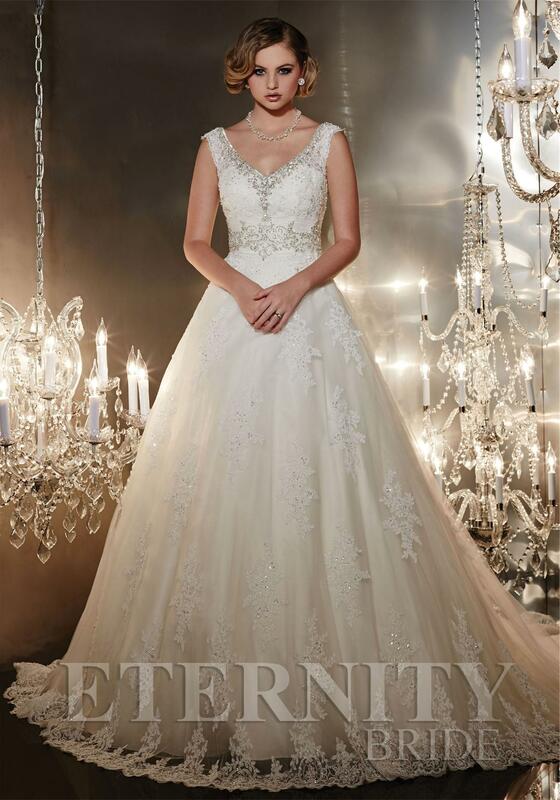 Eternity Bridal ballgown lace wedding dress with exquitire detailing throughout. Beading & diamante embellishments adorn the straps and bodice. Our sale dresses are sample gowns that have been on display in our Bridal Showroom and may have been tried on in-store. We take every care possible to keep our dresses in excellent condition, but they may show some light signs of handling. Ex-sample dresses may have loose beading/threads or be marked inside, and may require mending or dry cleaning after purchase. The sale price of each dress reflects its condition and any major defects will be noted in the dress description. If you are not fully satisfied for any reason, you may return your dress for a refund within seven days of receipt.